I expect it happens to you. You are pottering along and something catches your eye. So you take its picture. You potter further, begin a project and it starts to rain. You notice this. You snap at that. It's all beautiful but it doesn't amount to a post. But these are memories which can't be lost. The world wasn't created blog-sized. It's both bigger and smaller than that; bigger and smaller than anything that can be expressed. So this post is a bundle of pretty things. First up a Passion Flower. Where I live, passion flowers are not wild plants but this one has bunged its way through a fence, tangled itself with burdock, bramble and teasel - escaped! There are other plants round here which have done the same thing - honeysuckle, crocosmia, Spanish bluebells. 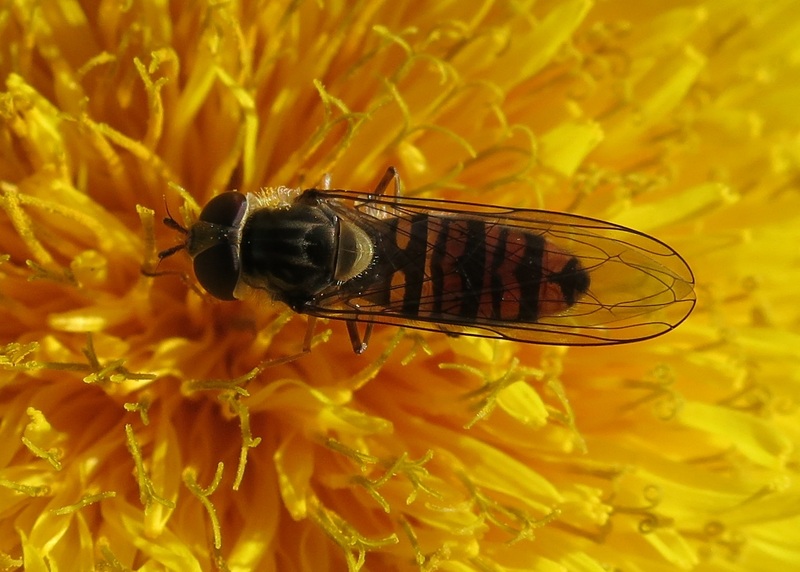 Next up, a Marmalade Hoverfly (Episyrphus balteatus). I'm so bowled over by its wings I have this little creature as my desktop picture. The trouble with the picture above though is that it obscures the white in the stripes. Here's the same little creature prancing around on the same flower. Because it's moving, the picture of it is blurred. But I like its elegance as well as its stripes. And now to the beach where the sea has been chucking up red seaweeds. There's a kind you can find here and hardly anywhere else in the UK. 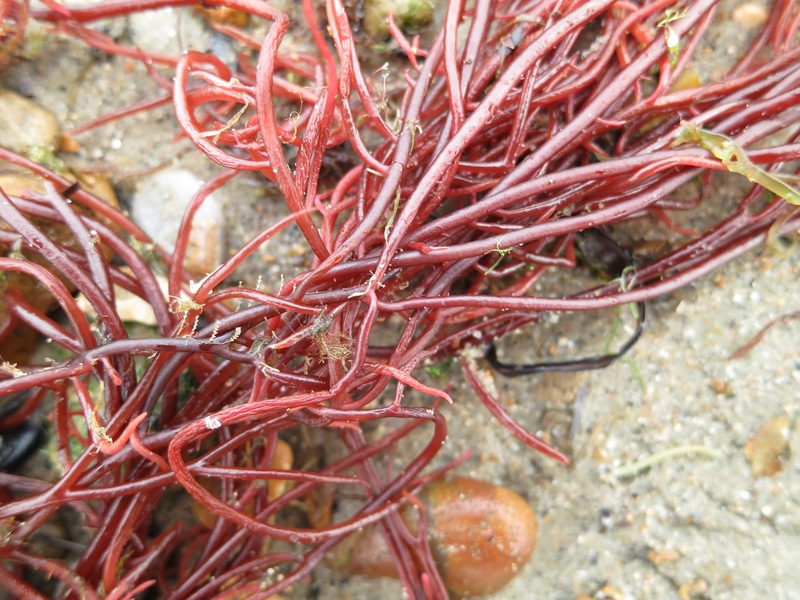 It's called 'Solieria's Red String Weed'. Isn't that a wonderful name? (Solieria chordalis.) When I first came across it in a book I misread it and for ages thought it was called 'Soldier's Red String Weed' and constructed a complete image of a soldier tying his boots with red laces. So we'll finish with the prosaic. 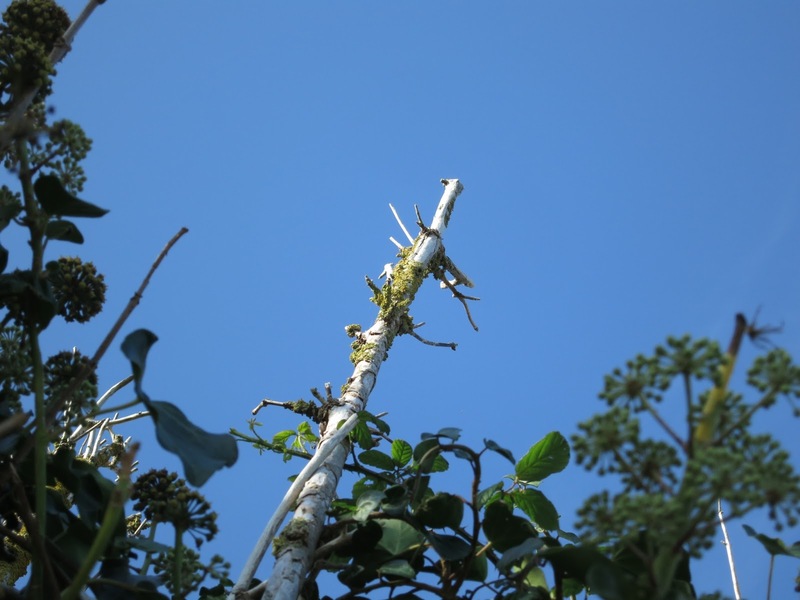 Sticking up above the brambles and framed by ivy is a dead branch of . . . oh! bother! What is it a dead branch of? Elderberry? It's got lichen on it, whatever it is. The less you know, the more possibilities there are. Do you know my other blog, 'Message in a Milk Bottle'? A photo a day. Mostly plants and trees but not exclusively so. And you can have the pictures sent directly to your inbox if you wish. Your photos are all so beautiful. Thank you for sharing. Beautiful images, especially the first photo of the hover fly, hope to do better with hover flys next year, wonderful little insects. Hello Carolann. I'm glad you too enjoy the excitement of not-knowing. 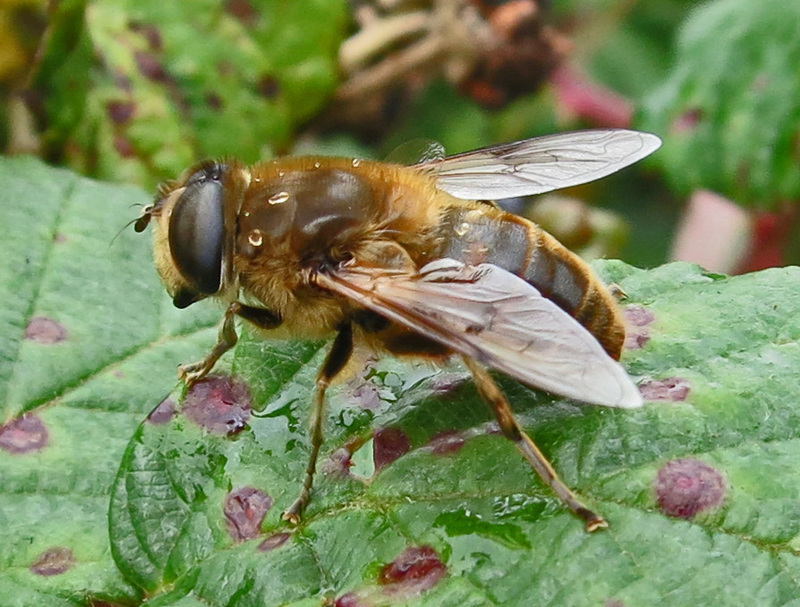 Amanda - I used to think a hoverfly is a hoverfly is a hoverfly. I'm converted. There are massives of kinds, many very different from each other and all beautiful. Maybe I'll one day have a camera that can do them justice. The pictures of them I show here have involved substantial cropping. Hello Gerald. 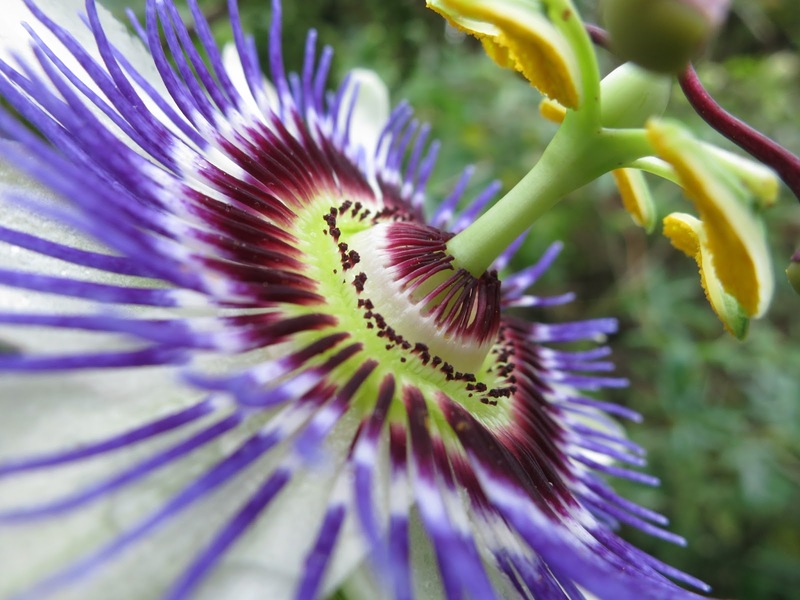 The structure of the passion flower is extraordinary isn't it? I took quite a lot of photos and had considered dedicating a whole post to it - but if I wrote posts about everything I'd have to become a full time blogger! actual plants and creatures I can sort of ID ... but seaweed when we are back to beach walks ... that's more complicated. I am glad you did a blog about a little of this and that!! Not sure I have ever seen red seaweed. What is that flower featured at the top of your site? It's a lovely picture; it looks like ivy but is it? Hello Tim. I'll have to go on a special search. From photos of the two kinds of seaweed, this is the more attractive. (Though they are broadly much the same . . . have different holdfasts but . . . ) Funny how one appreciates both beauty and rarity - and by 'rarity' in this case I mean a seaweed that is geographically constrained. Maybe when I track it down I'll find there are acres of it at low tide or after storms . . . but only here! Hello Diana. I know I'll never know how to tell one seaweed from another - well, not more than a few kinds anyway. Maybe one day I should do a post on them. It would force me to come to grips with whatever they are. Their reproductive cycle can be extraordinary. They are other-worldly; rather like lichens which are hard to get to understand too. Hello Philip. Yes. It's ivy on the header. Yet another peculiar plant - looks different in its youth from maturity, behaves differently in sun and in shade - and the flowers! How many people would know this is a flower? No petals! Hello Donna. Most of my posts have some kind of focus so I'm glad you have enjoyed this sort too. Seaweeds - I used to look at seaweeds a lot but the cliffs along this section of coast have become unsafe due to accelerated erosion and a whole flight of steps has collapsed just where winter storms would bring up masses of different varieties all in one go. We'll have to see what the weather will bring this winter. Even more could break away. Hello Flighty. 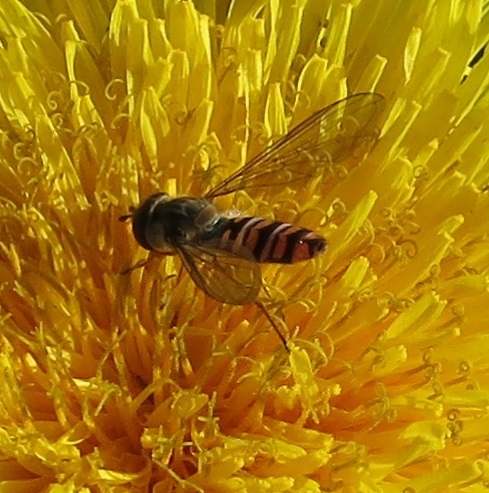 I was really lucky with the hoverfly pictures. It's impossible to tell how well photos have turned out until I get home. And with tiny creatures like this I can end up with a lot of background petals in crisp detail and no wings! I know what you mean, Lucy! Each year I look for Bee Orchids because I've never seen one, which makes them a very exciting prospect - even though I've seen lots of photos of them online! Beautiful images - well captured. 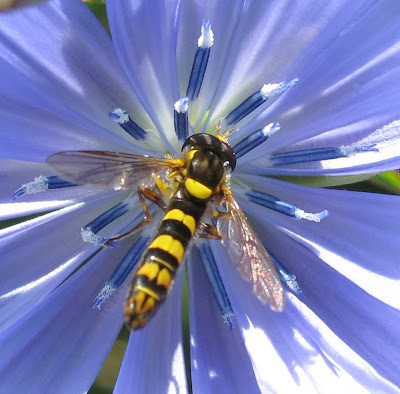 I agree about the first hoverfly photo -- so wonderful! I prefer your name for the red seaweed! 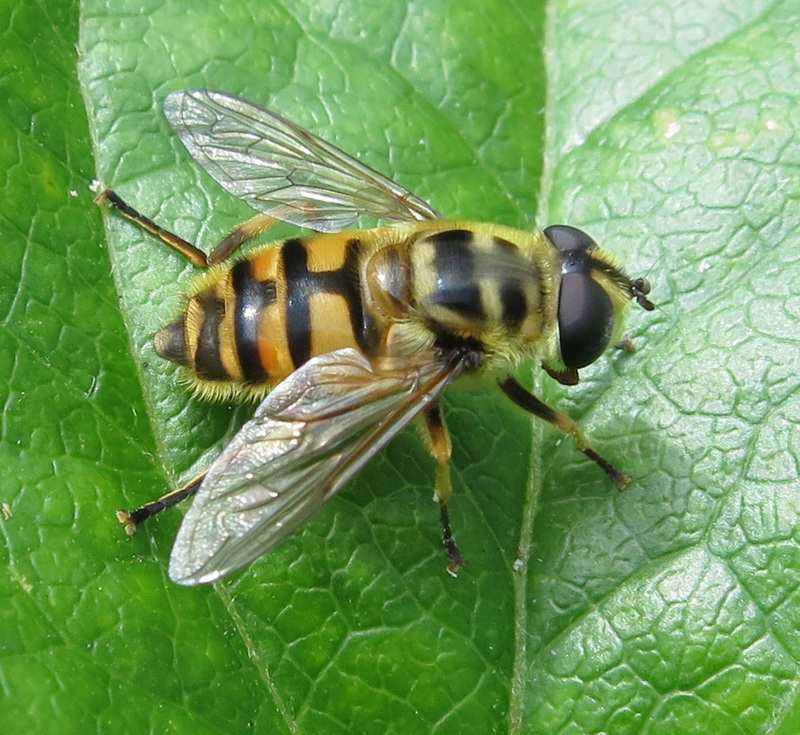 Magnificent photo of the hoverfly, and isn't the constrast of the bright green lichen against the deep blue sky wonderful .